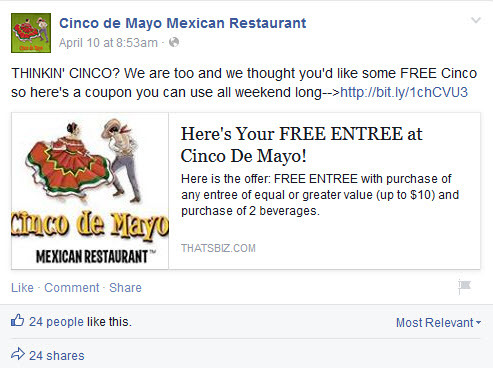 • Increase Cinco de Mayo restaurant visits and revenues at their seven Tennessee locations. To get the attention of Facebook fans a strong offer would be required. Known for authentic Mexican food and great drinks Cinco de Mayo decided on a “Buy One Get One Free” offer. The offer limited the free entrée to a $10 value and required the purchase of two drinks. The offer would be posted on the Cinco Facebook page. Since it was a strong offer and they had over 4,500 hundred fans the post was not boosted. Cinco de Mayo customers tend to be younger and smartphone savvy. If Cinco could limit the offer to a single use they felt the structure of the offer could increase revenues and margins at the same time. McClearen Design recommended using our That’s Biz “Get Coupon” landing pages to deliver the coupons to interested customers. McClearen only needed to provide the details of the offer, restrictions and expiration date. The That’s Biz system then creates a “Get Coupon” landing page and URL used in the Facebook wall post. Below is an example of one of the Cinco de Mayo wall posts. An email is immediately sent to the customer with a personalized coupon that is limited to a single use. The customer presents the coupon on their smartphone and redeems the coupon for the wait staff without the phone ever leaving the customers hands. No POS integration is required and the redemption happens table-side. Every coupon the customer receives includes the ability to share the offer with friends and family on Facebook and Twitter. To get the shared coupon, their friends complete the signup form to receive their personalized coupon. The system records the customers that got their coupon as a result of a share from a friend. The client was delighted with the results. To see a summary of the results click on the button below to see a brief case study of the Facebook campaign. Very briefly the promotion has resulted in 664 coupon redemptions and 937 email club opt-ins. The coupon was used 144 times by customers that got the coupon from friends sharing it with them. If you or your marketing firm would like to use our Get Coupon landing pages and coupons please complete the interest form clicking the “More Details” button. You can have a Get Coupon landing page created for you on a per campaign basis. No on-going monthly fee. To make it simple our team creates the coupon and landing page and provides you with the URL to use in your Facebook wall post. At the end of the campaign we’ll send you a spreadsheet detailing the coupon redemptions (name and email address) and a spreadsheet with the email club opt-ins to be added to your email list.